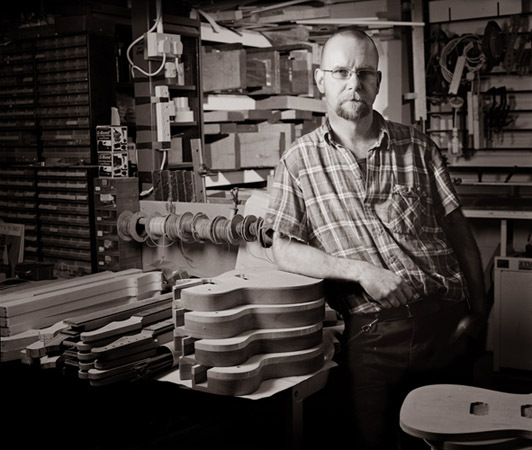 Dan first started working on guitars at the age of fourteen, honing his future skills from amongst others, master luthier Steve Smith (maker of the Heart and Heartwood guitars along with the early Goodfellow basses). In 1990, Dan established D.M. Guitars and by 1994 had begun to raise eyebrows from the media and guitar magazines who paid heed to guitars made with scrupulous care and impeccable detail, within the construction, playability and sound which in turn earned him critical acclaim from musicians, music retailers and other Lutheirs throughout the industry. By 1995, D.M. Guitars continued to provide the finest custom paint finish on guitars for musicians the world over and was the first call for many of the larger prestigious guitar brands in the business that required a faultless finish on their own models. It’s within these walls that Dan also garnered a reputation as a superior stringed instrument restorer, expert repairer and finisher of the highest order. In 2003, D.M. Guitars moved to a larger workshop in Rayleigh, Essex which now handled the company’s new Luthier Supplies department, allowing Dan to continue to serve public and trade customer’s with high quality guitars, paint finishes, bodies and necks constructed from the finest tonewoods available as well as offering instrument grade timber, paints and parts. From an impressive never ending list, some of the trade customers who have used Dan’s services over the years, ranging from paint finishes to prototyping and carrying out the entire production of their instrument range have included Burns London, JJ Hucke, JJ Guitars, Chandler Guitars, Arbitor, Martyn Booth Guitars, The Rickenbacker corps, Iceni Zoot, Wal Bass, Steve Toon, Legra Guitars, Charlie Chandlers Guitar Experience, Jaden Rose and Damian Probett Guitars. The new Luthier Supplies department grew with an overwhelming success and it was an obvious move to create a new company. Hence, in 2007 Dan MacPherson launched Tonetech Ltd. Joined later that year by Bill Quinn, Tonetech was developed further and would allow for a greater range of products, an on-line store and a dedicated sales team, which remains as one of the UK’s leading distributors of guitar parts, processed instrument grade timber and hardware. In 2008, Dan became a professional member of the National Association Of Instrument Repairers known as NAMIR ( expired) and a year later was gratefully accepted as a member of IMIT, the Institute Of Musical Instrument Technology (expired) this is also the year that see’s the business relocation to the heart of Southend-on-sea. In late 2010, after three years of developing Tonetech, Dan decided to resign as Director of Tonetech and leave the company in the capable hands of Bill Quinn, this allowed him to free up time to work on and develop a new range of MacPherson Guitars. Dan still works closely with Bill as a technical consultant and takes care of much of Tonetech’s timber selection and wood machining work. After nearly 20 years as a Pro’ Luthier, making custom instruments and making/spraying instruments for many other makers and brands, Dan decided it was time to launch his own range of guitars. So throughout 2010 to 2012, Dan worked on a brand new line of high-end guitars, and during this time launched the first four models, The Nomad, The Outlaw, The Pagan and The Rogue. Introduced under the new ‘MacPherson Guitars’ banner, these models underline Dan’s reputation for producing optimum, high-quality, hand-made instruments, constructed from the finest available tonewoods. Anyone who owns or has played a Dan MacPherson electric guitar or bass, will already be aware that ‘from the ground up’ is how Dan still likes to work, using only traditional machinery and hand tools. I say traditional machinery because that’s all you’ll find in Dan’s sawdust laden workshop, there’s not a CNC machine in sight. Some of the machinery in the workshop dates back to just before the classic guitars of the 50s were made – some of the hand tools are even older, so it doesn’t get much more traditional than that! These exquisite guitars are designed and made to meet the demands of just about every kind of guitar player and their playing styles. Or if required, customers can also have any guitar crafted to their own specifications with a true custom service that offers the player unique, bespoke, handmade instruments. Premium appointments include, exquisite book-matched tops, hand wound pickups, high quality hardware and of course…custom finishes. The new and exquisite range of ‘MacPherson Guitars’ can be seen within these pages. Check out the Gallery Page to see some prime examples of Dan’s work.